One of the biggest questions upon buying a mattress is, “How well does it repel dust mites?” Dust mites are a common issue throughout all households and can be a hazard to your health and can prevent you from living your healthiest lifestyle. Some of the symptoms of a dust mite allergy are trouble breathing, watery and itchy eyes, sinus trouble, itchy skin, and hives. These symptoms may be made worse by the climate in which you live in or by the changing seasons throughout the year. While there are precautions to take when preventing dust mites, such as using an air purifier, dehumidifier, and vacuuming and cleaning regularly, the most common place dust mites live is in your mattress. Making the switch to a mattress with organic latex is the best choice for dust mite prevention and overall better health. Palmpring’s Organic Mattresses are made with natural, certified organic latex. Organic latex naturally breathes and does not retain water. This means that no moisture accumulates within the mattress for the dust mites to feed on and thrive in. Dust mites also thrive in an innerspring or even a hybrid mattress because they can easily multiply and accumulate their waste inside the open pockets of metal springs. These open spaces trap moisture, dead skin cells, and pet dander, which creates the perfect home for dust mites. Palmpring Organic Mattresses have no empty spaces because they have no metal springs. 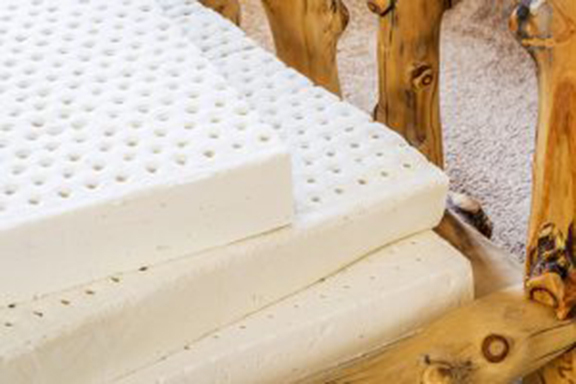 Our mattresses are whole layers of organic latex and/or organic coconut coir. Our mattresses are also encased in an organic wool and organic cotton cover, making the cover all natural, breathable, and dust mite resistant due to lack of moisture retention. Organic latex is a fundamental element of our mattresses, such as the Agra mattress which is all organic latex. However, our other mattress types have alternating layers of latex and coconut coir. Our coconut coir is made by taking coconut fiber and coating it with the same organic latex used in our mattresses, creating the perfect healthy combination. Coconut fibers have the same moisture resistant properties as the natural latex, cotton, and wool. By using only natural organic materials and not wasting any inner space with metal springs or artificial fillers, we are proud to say our organic mattresses are excellent at resisting dust mites, as well as bacteria, mold, and bed bugs. While it is always important to take proper care of your mattress, as well as washing your bedding on a regular basis, choosing a mattress (and also pillows!) made with natural, organic materials can only benefit your sleep and overall health. Take a look at all of our options here!